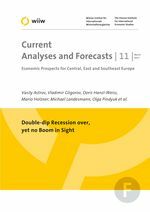 In Montenegro, forecasts for this and the next two years are not all that different from that for the neighbouring countries and the Balkan region as a whole. Prospects in the medium term depend on the success of the tradable sectors, which in turn will depend on the regional and the developments in Europe and in Russia. The fact that the country is negotiating with the EU should prove helpful. The main hurdle, rule of law issue, has now been shifted to the beginning of the negotiations and will be a challenge. Once that is cleared, Montenegro can expect to be the next new member of the EU.